Now I'm not big on camping, but the Red Kite Tree Tent might be worth shimmying into a sleeping bag for. 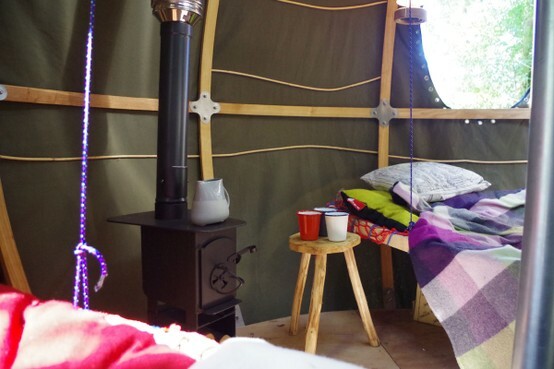 A company named Sheepskin that specialises in quirky accommodation, has just launched the Red Kite Tree Tent in Builth Wells in Powys, Wales. It's located in an area private woodlands, great for hiking and tramping. I've not had the pleasure yet to actually see the tent for myself, but judging from the images on the Sheepskin website, it looks more like a big balloon on stilts, perched in between the branches of a tree. The tent is made of thick wool felt, which keeps guest warm at night. Inside there's space for two people. The beds are suspended from ropes, and decked out with colourful, warm duvets, there's a table and chairs and even a wood stove for those cold winter eves. For those who can really not switch off from the outside world, there's a desk with a socket to charge the laptops and Blackberry's. Shower, wash basin and toilet are located on a separate deck that can be accessed via a suspended walkway. Another walkway connects the tent to an observation deck where guests can enjoy the sunsets while having a glass of wine. To stay here you pay £299 for three nights which includes a guide and a welcome hamper, but if you want to check it out for less, the tent will be on display at the Exel during the Grand Designs Live on May 4th-12th. Might be worth trekking to East London for. Wow looks great fun, I'd be up for a night or two in that. Quirky and would definitely feel like a adventure. I'd like to bring a bunch of honey and dress up like a bee. Always wanted to be a bee. Love this concept. It looks far more comfortable than the gypsy caravan I "glamped" in last year! Love this concept. It looks much more comfortable than my previous glamping experience! Haha, yes this brings glamping to a whole new level.